My music-theatre composition Mini Stories was commissioned by the Northlands Festival in 1997 and premiered at the Mill Theatre in Thurso, Scotland on 8 September that same year, with the Russian actor Victor Sobchak as the narrator and the LYS Ensemble performing the music. The piece was revised in 2002. I was introduced to the writings of Daniil Kharms by an old friend and Russophile, Ken Reynolds, in the early 1970s. It was a memorable discovery that produced a strong feeling of identification, and the desire to use some of Kharms’s writings for a music-theatre piece if and when an opportunity would arise. Eventually, Kharms’s writings inspired me to compose not only Mini Stories, but also a large scale opera, Die Wält der Zwischenfälle (The Whirld of Incidences) which was co-commissioned by Stadttheatre Lübeck and Netzzeit Vienna. The opera was premiered at Stadttheatre Lübeck on 11 February 2004, and received its Austrian premiere in Vienna the following year. The stories by Kharms that I selected for this work come from a collection of short stories entitled Incidences, that were found amongst papers that came into the possession of the American professor George Gibian on one of his visits to Eastern Europe in the late 1960s. Incredible as it may seem, these amazing pieces written in Soviet Russia more than 70 years ago could easily sit beside the Western absurdist literature of the sixties and seventies: the stories range in content from mundane everyday events to black humour, absurd occurrences, mindless violence, mild eroticism and to stories reminiscent of fairy tales. The last story I use refers to a red-haired man, who is gradually “dismantled” until he exists no more. It is tempting to see this last story as a reference to the near total annihilation of peoples’ freedoms during Stalin’s reign of terror, when the safest conduct was to be virtually “unseen” and “unheard”. It also brings to mind the final days of Kharms’s life, with his prolonged death from starvation in a prison hospital in Leningrad in 1942. On a first reading, the stories in their extreme brevity may seem startlingly simple, and even frivolous, but on closer inspection they begin to assert their grip on the reader. They come across as humorous, cynical and even cruel in their observations of human existence and behaviour. There is a disturbing contrast between the content of the stories and the minimal number of words that Kharms employs, which sometimes threatens to undermine the content of the story. Many of the stories are so rigorously pared down that they no longer seem to fit any established patterns. On the other hand, some are imbued with an unworldly atmosphere, as if written by an ‘all-seeing’ superior being, observing mankind from afar. These stories are difficult to classify and hard to interpret. To most readers they will seem inscrutable, but that was no doubt Kharms’s intention. As Anatoli Aleksandrov noted of Incidences: “The world has been losing its agreeable order—it is in discord, even nightmarish. Without order, there can be no hierarchy, and without hierarchy there can be no sense of value”. To quote further from Neil Carrick’s monograph, ‘Daniil Kahrms: Theologian of the Absurd’: “The stories pose the reader a puzzle, but apparently provide insufficient clues for its solution”. When I started work on Mini Stories, my original intention was to create a music-theatre piece that could be staged in either a theatre or as part of a concert, without requiring any theatrical props. Having chosen twelve stories from Incidences, I devised an order that was intended to give a sense of underlying structure to the whole composition. By placing the shortest stories at the beginning, and gradually incorporating the more substantial ones, a focal-point was reached with A young man who astonished a watchman. This story reveals a mystical, even religious side to Kharms. Two much shorter stories then follow, with the last, Blue notebook No 10, the shortest of all. It is an apt text for bringing Mini Stories to its conclusion. Kharms’s sad and lonely death certainly comes to mind when reading or listening to it. In composing the music, I intended the texts to be recited one by one, with my own musical ‘mini stories’ acting as interludes, hopefully enhancing the absurdity of the text by existing on a different plane. The titles of the interludes are my own, except for the final piece (Victory Boogie Woogie—taken from the title of Piet Mondrian’s final, unfinished work), and reflect my original intention of creating music that is at variance with the text itself. As the composition progressed, the absurdist nature of the stories began to assert their influence, and to dictate to a degree the musical content of the interludes. Not only did the essence of the text infiltrate the music, but the atmosphere of Leningrad—as I imagined it to be during that period—seems to be evoked, leading to some highly atmospheric music. I decided to revise Mini Stories in 2002, and to incorporate fragments of quiet music as a background to the narration of the text, to give the impression of a near-continuous sonic presence. 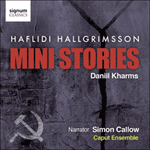 On repeated listening it seems to me, at least, that these new connections have given Mini Stories a greater sense of unity. It’s worth mentioning in closing that Kharms was a great lover of music, and above the harmonium in his room was a sign that read: “Here we only play Bach”. Since a long time ago, people have been reflecting on what intelligence and stupidity are. With a respect to this, I remember an incident. When my aunt gave me a desk, I said to myself, “I’ll sit down at the desk, and the first idea I’ll come up with at that desk will be an especially intelligent one.” But I wasn’t able to think up an especially intelligent idea. Then I said to myself, “Very well. I didn’t succeed in thinking up an especially intelligent idea, so I’ll think up an especially stupid one.” But I wasn’t able to think up an especially stupid idea, either. It is very difficult to do anything extreme. It is easier to do something in the middle. The center requires no effort. The center is equilibrium. There’s no struggle there. A certain short man said, “I’d do anything if only I could be just a little taller.” He had hardly finished saying this when he saw a witch standing in front of him. “What do you want?” the witch asked him. The short man stood there, and he was so frightened, he couldn’t say anything. “Well?” said the witch. The short man stood there and said nothing. The witch disappeared. At that point the short man started crying and biting his nails. First he bit all the nails on his fingers and then those on his toes. Once Orlov ate too many ground peas and died. Krylov found out about it and died too. Spiridonov up and died all by himself. Spiridonov’s wife fell off the cupboard and also died. Spiridonov’s children drowned in the pond. Grandma Spiridonov took to drink and hit the road. Mikhailov stopped combing his hair and caught a skin disease. Kruglov drew a picture of a lady with a whip in her hand and lost his mind. Perekhrestov was sent four hundred rubles by telegram and put on such airs that they fired him at his office. Good people, but they don’t know how to take themselves in hand. An amazing thing happened to me: I suddenly forgot which came first, 7 or 8. I went to my neighbours and asked them what they thought about that. I was really amazed when they told me that they too couldn’t remember the counting sequence. They remembered 1, 2, 3, 4, 5, and 6, but they forgot what came after that. We all went into the grocery store at the corner of Znamensky and Basseynaya streets and asked the cashier. The cashier smiled sadly, took a little hammer out of her mouth, and slightly twitching her nose, said, “I think 7 comes after 8 in those cases when 8 comes after 7.” We thanked the cashier and ran joyfully out of the store. But then, thinking over the cashier’s words, we again fell silent, because her words turned out to make no sense. What were we to do? We went into the summer park and counted trees. But after we reached 6, we stopped and argued. Some thought 7 came next, and others that 8 came next. We argued for a long time, but fortunately a little boy fell off a park bench and broke both jaws. This distracted us from our argument. Then we all went home. Semyon Semyonovich, having put on his glasses, looks at a pine tree and sees that a peasant is sitting in the pine tree and shaking his fist at him. Semyon Semyonovich, having taken off his glasses, looks at the pine tree and sees that nobody is sitting in the pine tree. Semyon Semyonovich, having put on his glasses, looks at the pine tree and again sees that a peasant is sitting in the pine tree and shaking his fist at him. Semyon Semyonovich, having taken off his glasses, again sees that nobody is sitting in the pine tree. Semyon Semyonovich, having put on his glasses again, looks at the pine tree again, sees that a peasant is sitting in the pine tree and is shaking his fist at him. Semyon Semyonovich doesn’t want to believe in this phenomenon and decides it is an optical illusion. Koratygin came to Tikakeev’s and didn’t find him at home. Tikakeev just then was at the store and bought sugar, meat, and cucumbers. Koratygin hung around Tikakeev’s door and was about to write him a note, when he looked and saw Tikakeev carrying an oilcloth bag in his hand. Koratygin saw Tikakeev and shouted to him, “I’ve been waiting for you for a whole hour.” “That’s not true,” said Tikakeev; “I was only gone for twenty-five minutes.” “I don’t know about that,” Koratygin said, “but I’ve been here for a whole hour.” “Don’t lie,” said Tikakeev. “It’s a shame to lie.” “My dear sir,” said Koratygin, “will you please take the trouble to choose your expressions carefully?” “I think…,” Tikakeev was about to say, but Koratygin interrupted him. “If you think…,” he said, but here Tikakeev interrupted Koratygin and said, “You are a fine guy yourself.” These words so enraged Koratygin that he squeezed one of his nostrils with a finger and from his other nostril blew his nose at Tikakeev. Tikakeev took a big cucumber out of his bag and hit Koratygin with it over the head. Koratygin clutched his head, fell down, and died. That’s how big the cucumbers are that they sell in the stores nowadays. The other day Petrakov wanted to go to bed, but he missed the bed and plopped down beside it. He bumped the floor so hard that he lay on the floor and couldn’t get up. So Petrakov gathered himself together and with all his strength pulled himself up on all fours. But his strength gave out, and he fell down again on his stomach and lay there. Petrakov lay on the floor for five hours. At first he simply lay there; then he fell asleep. Sleep put strength into Petrakov. He woke up feeling perfectly fine, got up, walked around the room, and lay down carefully on his bed. “Well, now I’ll sleep,” he thought. But he didn’t feel like sleeping any more. He turned from side to side and couldn’t fall asleep at all. Shashkin (Standing in the center of the stage): My wife has run away. What can I do? It’s all the same; once she’s run away, you won’t get her to come back. One must be philosophical and wise and understand that anything can happen. Blessed is he who has wisdom. Kurov doesn’t have wisdom, but I have. I read a book in the public library twice. It said very intelligent things about everything. I take an interest in everything, even languages. I can count in French and I know how to say stomach in German: der Magen. That’s how. Even the painter Kozlov is my friend. We drink beer together. And Kurov? He can’t even tell time. He blows his nose in his hands, eats fish with a fork, sleeps with his shoes on, doesn’t brush his teeth. Phooey! That’s what I call a peasant. Take him into society. They’ll throw you out and curse you. If you are an intellectual, don’t go around with a peasant. You can’t get the better of me. If I’ve got to talk to a count—I talk to a count. If I have to talk to a baron—I talk to a baron. You can’t even figure out right away what kind of person I am. It’s true that I know German badly, though I do know that stomach is der Magen. But if they say to me, “Der Magen findel mooey,” already I don’t know what it is. But Kurov doesn’t even know der Magen. And she ran away with that kind of a dummy. You can see what she wanted! You see, she doesn’t consider me a man. She says, “You have a voice like a woman.” But it’s not a voice like a woman but a voice like a child. A delicate voice, a child’s voice, not at all a woman’s voice. What a fool she is. What did she want Kurov for? The painter Kozlov says that I’m just made for a portrait. Kalugin fell asleep and dreamed a dream. He was sitting in some bushes, and a militiaman went past the bushes. Kalugin woke up, scratched his mouth, and fell asleep again, and again he dreamed a dream. He was walking past some bushes, and in the bushes a militiaman was sitting and hiding. Kalugin woke up, put a newspaper under his head so as not to make the pillow wet with his slobbering, and fell asleep again, and again he dreamed a dream. He was sitting in some bushes, and a militiaman was walking past the bushes. Kalugin woke up, changed the newspaper, lay down, and again fell asleep. He fell asleep and again he had a dream. He was walking past some bushes, and a militiaman was sitting in the bushes. At that point Kalugin woke up and decided to sleep no more, but immediately he fell asleep and had a dream. He was sitting behind a militiaman, and bushes were walking past. Kalugin shouted and turned over in his bed, but he was no longer able to wake up. Kalugin slept for four days and nights in a row, and the fifth day he woke up so thin that he had to tie his boots to his feet with twine so that they would not keep falling off. In the bakery, where Kalugin always bought wheat bread, they didn’t recognize him and slipped him bread that was half rye. The Sanitary Commission inspected the apartment house and saw Kalugin, and declared him to be unsanitary and good for nothing, and ordered the apartment cooperative to throw Kalugin out with the trash. They folded Kalugin in two and threw him out with the trash. The watchman looked at the young man, screwed up one eye, then screwed up the other eye, then rubbed his beard, then looked at the young man once more and said, “Don’t loiter around; get a move on.” “Excuse me,” said the young man. “I’m on urgent business. They even have a room ready for me there.” “Fine,” said the watchman; “Show me your ticket.” “I don’t have a ticket. They told me they would let me in without one,” said the young man, looking straight at the watchman. “Well!” said the watchman. “So what do you say?” asked the young man. “Will you let me through?” “All right,” said the watchman. “Go ahead.” “But which way should I go? Where?” the young man asked; “I don’t even know the way.” “Where do you have to go?” the watchman asked and made a severe face. The young man smiled, raised one of his yellow-gloved hands, waved it over his head, and suddenly disappeared. The watchman sniffed the air. The air smelt of burned feathers. “Oh, my, my,” said the watchman; he unbuttoned his jacket, scratched his stomach, spat at the spot where the young man had stood, and slowly went into his hut. Andrey Andreevich Myasov bought a wick at the market and carried it home. Along the way Andrey Andreevich lost the wick and went into a store to buy 150 grams of Poltava sausage. Then Andrey Andreevich went to a dairy store and bought a bottle of yogurt; then he drank a small mug of kvas at a counter and waited in line to buy a newspaper. The line was quite long, and Andrey Andreevich spent about twenty minutes waiting in it, but when he got to the paper boy, he had just sold the last newspaper right in front of his nose. Andrey Andreevich stood around for a while, then left for home, but on the way he lost the yogurt, went into a bakery, bought a French roll—but lost the Poltava sausage. Then Andrey Andreevich went directly home, but along the way he fell down, lost the French roll, and broke his pince-nez. Andrey Andreevich came home angry and right away went to bed to sleep, but he couldn’t fall asleep for a long time, and when he did fall asleep, he had a dream: he dreamt that he had lost his toothbrush and was cleaning his teeth with some kind of candle holder. There was once a red-haired man who had no eyes and no ears. He also had no hair, so he was called red-haired only in a manner of speaking. He wasn’t able to talk, because he didn’t have a mouth. He had no nose either. He didn’t even have any arms or legs. He also didn’t have a stomach, and he didn’t have a back, and he didn’t have a spine, and he also didn’t have any other insides. He didn’t have anything. So it’s hard to understand whom we’re talking about. So we’d better not talk about him any more.